Any chance the CD will come back in stock? Would love to pick up a copy. The "Novelty" reissue was remastered for vinyl. The CD and digital files were already remastered a few years ago at Silver Sonya, so those have been left as they are. I'm curious...I just bought the LPs for this album and 'Novelty'. The description for 'Grippe' says it's "re-cut" but doesn't mention being "remastered", as 'Novelty' does. I am looking at the MP3s that came with my LP purchase for 'Grippe'. They do appear to be more conservative in the mastering (around -3dB as opposed to 'Novelty's tracks, which go right up to 0 dB). So the 'Grippe' MP3s are not remastered? Is that correct? Great Songs. I always thought this album was under appreciated. Nice to have it on vinyl again. There's so much energy and hints of greatness to come on the next album Novelty - this is a great album to add to my Jawbox collection - and in Purple vinyl no less! 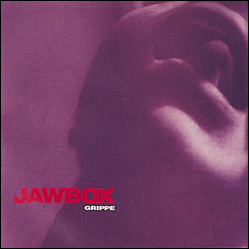 The 12" LP was re-cut in August 2013 at Chicago Mastering Service, and features a free MP3 download, which includes the 11 original album tracks plus five extra songs — the four tracks from Jawbox's 7" debut EP and the song "Footbinder," which first appeared on the Simple Machines compilation EP, Screw.